Ben recently posted about different kinds of wood-drilling countersink drill bits that have built-in non-marring depth stops. Sometimes it’s helpful to have a depth stop, other times you don’t really need it. When driving flathead screws into wood, you don’t always need to first countersink the hole either, but that is typically only true when driving the screws into softer material. Some screws have cutting ribs under the screw head, but even those might not work well in harder wood materials. For the cleanest installation, you’re going to want to use a countersink, and to save time, not to mention get perfectly centered countersinks, you’re going to want to use an all-in-one countersink. 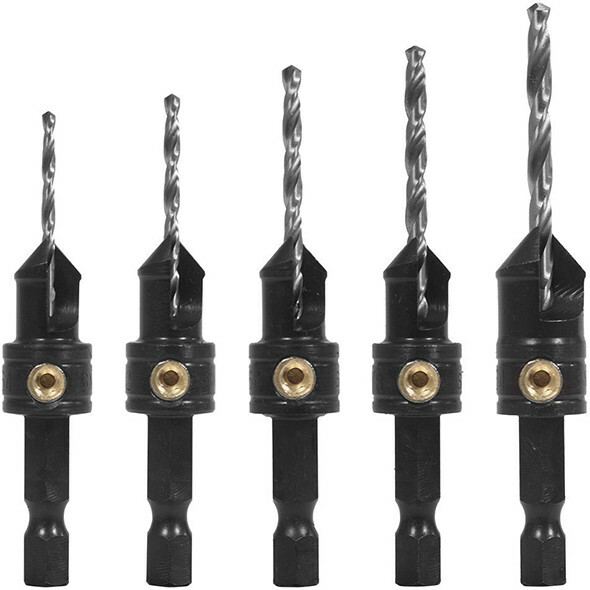 These types of drill bits drill a screw hole and then create a countersink for flush-mounting flathead screws all in one drilling step. If you drill deep enough with a countersink, you can even mount flathead screws beneath the surface, for covering up with a plug. Snappy is quite possibly the best name in the business. There are a number of brands that make these all-in-one bits, but Snappy is the one you’ll hear about most. It’s certainly the brand I hear the most good things about. Snappy’s 5-piece countersink bit set comes with 5/64″, 3/32″, 7/64″, 1/8″ & 9/64″ sizes, which correspond to what you need for #4, #6, #8, #10, and #10 screw sizes. The countersink angle is 82°, which corresponds to what you’ll find on most (if not all) flathead wood screws. The drill bits can be adjusted to length, via set screw, and replaced if necessary. The alloy countersink cutting blades are hardened for long life, and Snappy says they can be resharpened. Each features a 1/4″ hex shaft, so you can use it in a drill or cordless screwdriver. You could probably use them in a hand drill too. You can also buy these bits as part of a 25-piece quick change drilling and driving set. TiN-Coated Drill Bits – Yay or Nay? These kits that combine the drill bit, counterbore, countersink, and depth stop are very handy. If you are doing workworking in wood besides soft lumber, you do need all these steps, as well as a pilot hole. That is, if you are using wood screws and not drywall or deckscrews. 1) A corded drill with a manual chuck holding a small bit for the pilot hole. Some automatic chucks have a hard time holding smaller bits, so I would use an old school drill for this. 2) A cordless drill with a larger bit for the counterbore. For wood screws you want a counterbore for the unthreaded portion of the screw. Otherwise, you are adding friction and can snap off the head of the screw. Honestly, this is really only needed when you are driving longer screws where the friction is higher. I put a piece of tape on this bit to act as a depth stop. 3) Another cordless drill with a countersink bit. 4) An cordless impact drill to actually drive the screw. Thats 4 drills I would use, and a kit like this will reduce the number to just 2. And this may seem like a hassle, using 4 drills. But sheetrock screws aren’t really for good strong structural joints, you have to go with wood screws or bolts. And when you use wood screws in hardwood, you have a good chance or stripping the head (with a regular drill) or snapping off the head (with a impact drill), if you don’t predrill the countersink and counterbore. So this is a very useful product. There are also products out there that use a tapered drill bit, so the first part of it is thin like a pilot bit, and higher up it widens to make your countersbore. And it then has the adjustable countersink/stop piece. Thats what I use now. seems like a nice kit – looks quality too. I might need a set. However – I either use the wrong things or the right screws as all I have ever done on any wood project is drill a pilot hole – counter sink and then run the screw in. today I use newer cordless on the drill – and impactor on the countersink and to run in the screw because they are hex shanked and QR. I’ve always wondered how well and how long those drill bit countersink devices work and last – since I do rare wood working I’ve never bought a set. Those do indeed look nice. One of these in the #8 size in my M12 drill and a #2 square drive bit in my M12 impact driver have become my go to package for assembling cabinets the last couple of years. Between work and family commitments, I don’t have anywhere near the free time for woodworking that I’d like so anything that gives me the same (or better) results over other methods in less time is much appreciated. Snappy makes a quality product but I have had poor luck with straight pilot bits. They stick and break easily in hard wood. I’ve had a set for years. Great price, and made well in the US. This is an excellent value. I have these, but without a depth stop for me at least it seems like trial and error to get the indent hold deep enough to make the screw head flush resulting in inconsistencies. Maybe Im just not using them correctly. which do have the depth stops. Had my set of these for around a year. Paid for themselves several times over even with their £27 price tag in UK! Sold in UK under the Trend brand but still labelled Snappy. At that price I’d expect a storage pouch or box but a minor gripe really. Totally agree with comment regarding 2x vs. 4x drill-drivers. If I ever need to replace, the tapered set linked above look excellent. Actually Stuart, Fuller are the gold standard in this category. I don’t recall hearing that brand name before, but will take a look at them, thanks! A quick search of online user reviews shows that they do seem to be highly regarded, but I want to dig deeper when I’ll have a chance. Np sir, snappy countersinks and hinge bits are copies of higher quality variants such as fuller for countersinks and vix bits for hinge bits. W. L. Fuller, to be clear. Not the import brand of Fuller tools.